New Hampshire Department of Health and Human Services, in collaboration with the Centers for Disease Control and Prevention expanded the public health network. By 2006, New Hampshire’s public health networks covered the entire state. The Greater Manchester Public Health Region is one of thirteen statewide. The Greater Manchester Public Health Region includes the municipalities of Auburn, Bedford, Candia, Deerfield, Goffstown, Hooksett, Manchester, and New Boston. According to the 2011-2015 American Community 5-year estimates 182,287 residents live in the Greater Manchester Public Health Region. The region is considered to be the most racially, ethnically, culturally, and linguistically diverse and densely populated area in the state. WILL YOU (OR SOMEONE YOU KNOW) NEED HELP IN AN EMERGENCY? Sign-up to receive Bedford alerts. Sign-up to receive Hooksett alerts. Resident critical information during a crisis. Resident information on Disaster Preparedness. The Greater Manchester Region along with the other thirteen Regional Public Health Networks, work in concert with other state agencies to address the goals and objectives outlined in the state plan, Collective Action – Collective Impact (CA-CI): New Hampshire’s Strategy for Reducing the Misuse of Alcohol and Other Drugs and Promoting Recovery, which was released in February 2013. The City of Manchester Health Department and the Greater Manchester Public Health Network's collective vision is to transform public health in our region to an integrated system capable of seamless collaborations among all healthcare providers and public safety personnel with constructive engagement of patients, families and communities. With the enactment of the Affordable Care Act, all not-for-profit hospitals nationally must conduct a Community Health Needs Assessment (CHNA) every three years. 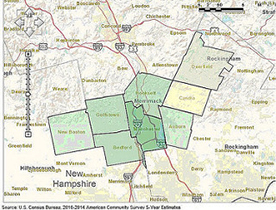 The state of New Hampshire requires a Community Health Needs Assessment every five years. The hospitals use this information to create an implementation plan to address the community needs identified through this process.